What Is Guam And Why Is North Korea Threatening It? : The Two-Way The U.S. island territory is small but strategically significant. It's home to a naval base and an Air Force base. Pyongyang has long viewed it as a provocation — and a target. 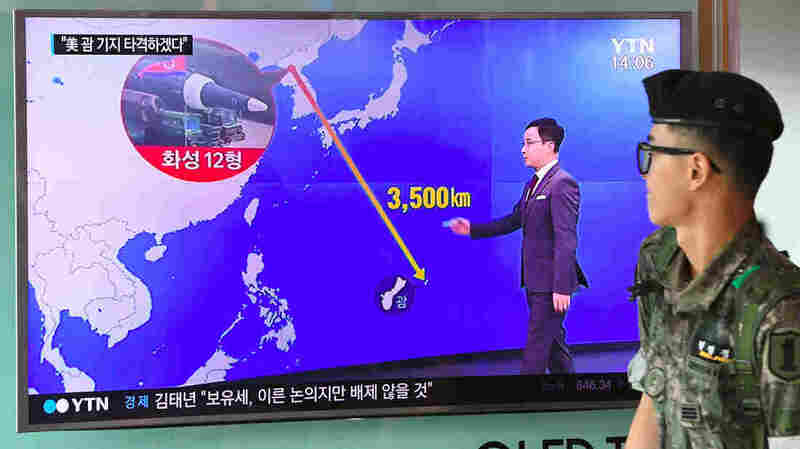 At railway station in Seoul on Wednesday, a South Korean soldier walks past a television screen showing a graphic of the distance between North Korea and the U.S. territory of Guam. There is trouble in paradise — but that is nothing new for Guam. The U.S. island territory in the western Pacific Ocean is ringed by beaches, studded with palm trees and packed with bombs. It's small but strategically significant. After President Trump threatened to bring "fire and fury" down on North Korea, Pyongyang said Wednesday that it is "carefully examining the operational plan for making an enveloping fire at the areas around Guam." Guam — only about 30 miles long and 4 miles across at its narrowest point — is located about three-quarters of the way from Hawaii to the Philippines. The isolated island is home to thousands of U.S. troops stationed at Andersen Air Force Base and Naval Base Guam. The U.S. seized Guam from Spain in 1898 to provide a fueling station for the U.S. fleet in the western Pacific. It quickly became a key part of international communication (the American trans-Pacific telegraph cable passed through Guam) and transportation (it was a fueling stop for trans-Pacific flights). And it played a crucial role in multiple wars. In World War II, Guam was seized by the Japanese shortly after the Pearl Harbor attacks and won back by the U.S. in 1944. The suffering of Guamanians during the occupation was acknowledged by the U.S. Congress last year, in a bill providing for compensation to survivors. 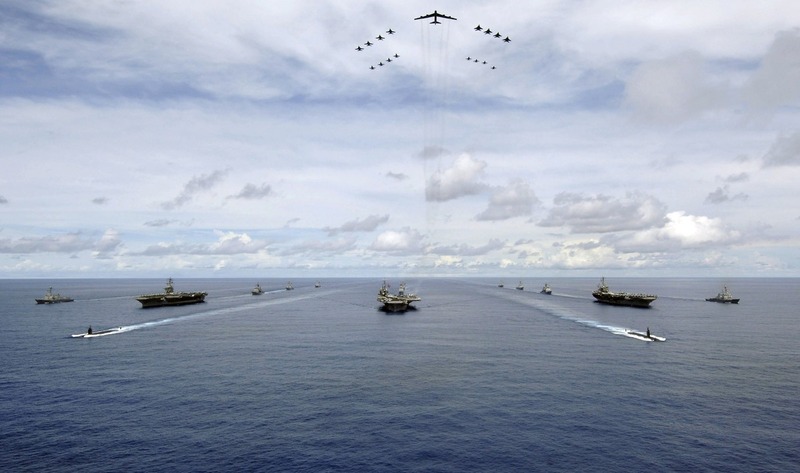 The USS Nimitz, USS Kitty Hawk and USS John C. Stennis carrier strike groups travel in formation during an exercise in 2007 in the Guam operating area. After the end of the Cold War, the military started to downsize operations. But that didn't last long. At the turn of the millennium, military leaders re-evaluated the importance of keeping forward-deployed forces close to Asia and began sending money, equipment and troops back to the island. Today, there is a continuous bomber presence. There is an anti-missile unit, focused almost exclusively on North Korea (another anti-missile system has been installed in South Korea). The U.S. uses the island for war games and joint exercises. Guam also stores a massive quantity of weapons. As of 2014, according to Andersen Air Force Base, Guam held "the largest munitions stockpile in the world" — stored in igloos "deep [in] the jungle, surrounded by brown tree snakes and wild boar." Bombers "deployed from Guam frequently come flying in the skies over South Korea and explicitly carry out drills for actual war," Pyongyang said in its recent statement, calling Guam "the United States' outpost and starting base for invasion." "Is the United States indeed the only one with the option of what it calls a preventive war?" North Korea asked, raising the possibility that it would pre-emptively strike Guam. 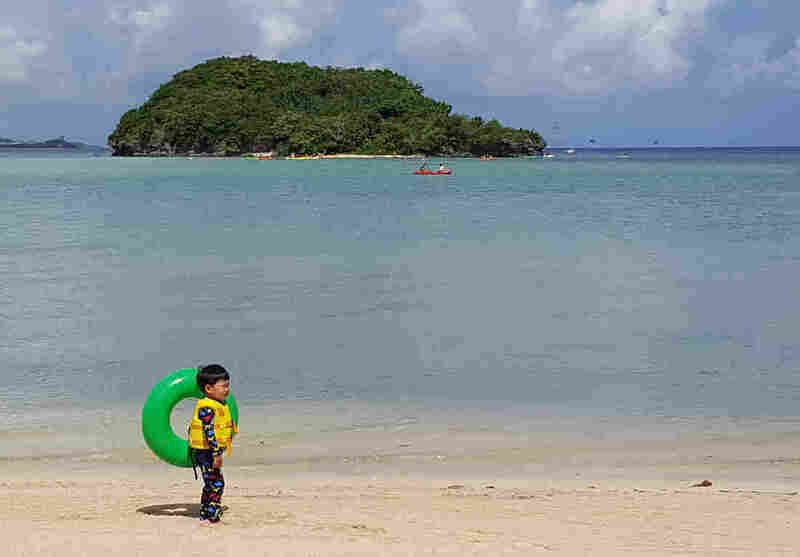 A child plays on a beach in Guam's capital, Hagatna, on July 14. About 163,000 people live on the island. Citizens of self-governing Guam are U.S. citizens, although they can't vote for president. The military presence on the island has injected money into Guam's economy and is welcomed, even celebrated, by many residents. But proposals to house even more troops there have raised some concerns about environmental sustainability and cultural identity and colonization, particularly among the indigenous Chamorro population. As for the specter of a North Korean attack, that is not new for Guam. By 2004 — long before North Korea had missiles that could hypothetically reach the U.S. mainland — South Korean newspapers were reporting that Pyongyang had the capacity to strike Guam. In 2013, Pyongyang started telling the U.S. that it "should not forget" that Andersen Air Force Base, specifically, was within range. Today, as Pyongyang once again calls Guam out by name, the island's governor, Eddie Baza Calvo, says there is "no threat" to the island. But Mayor Paul McDonald of Agana Heights, Guam, tells NPR that the threat from North Korea — and the fact that Trump is "fighting back with words" — is being taken very seriously by residents. "Especially with our elders who have experienced the Second World War, when the Japanese force came and invaded Guam — you know, my mom, she's 91 years old and I was over at the office all day today," McDonald said. "She'd call me every 10 minutes to update her. We are really taking it seriously, a lot of the people in Guam." "While it is extremely unlikely that Pyongyang would risk the assured annihilation of its revered leadership with a pre-emptive attack on U.S. citizens, some residents of Guam are concerned. "Other residents are worried about the political atmosphere and the government's ability to find a peaceful solution.
" 'But I have to say, I'm not laughing now,' Thompson said. 'My concern is that things have changed in Washington, and who knows what's going to happen?' "
In a previous version of the map, Northern Mariana Islands was misspelled as "Northern Marina Islands."